Blank Noise presents ‘Everything You Need To Know about Sexual Harassment at the Workplace and Campus’. Equip yourself with an in-depth understanding of the Sexual Harassment of Women (Prevention, Prohibition and Redressal) Act, 2013, and say NO to victim blame at your workplace, campus or institution. Let the knowledge of the law and your rights as an employee, empower you to say #INeverAskForIt at your workplace, campus, everywhere. The sessions will be led by community member, Action Shero Abhaya Tatavarti, also lead consultant at Parity Consulting, Bangalore. Abhaya partners with organisations to implement the provisions of the Sexual Harassment of Women at Workplace (Prevention, Prohibtion & Redressal) Act, 2013 at workplaces. As per her role, she conducts sexual harassment awareness sessions, helps organizations consitute ICs and sits as an external member for ICs. Read more about Abhaya below. At the end of day 2, Jasmeen Patheja, founder Blank Noise will faciltate a 2 hour testimonial building session on sexual harassment at the workplace. The event is led by you and your questions. What would you like to know about the sexual harassment law at your workplace, campus or institution? Send in a question on this form. 1. Who is Action Shero Abhaya Tatavarti and why is she building this? Action Shero Abhaya has been volunteering at Blank Noise since July 2018, and is committed to ending sexual and gender based violence. Abhaya is also a lead consultant for the prevention of sexual harassment, at Parity Consulting. She joins forces to end victim blame and build mission #INeverAskForIt . To know more about Abhaya’s views on sexual harassment at the workplace, you can read her article here. 2. Who is this event for? These sessions are open to anyone who would like to know more about the workplace sexual harassment law in India. This includes anyone from students to freelance workers. 3. Where can I pay the registration fee? 4.What will Blank Noise do with the information I share in the registration form? - Creating a community of Action Sheroes, Heroes and Theyroes at offices who can effect change in their work environments with new perspectives. - Build and enable more context specific programmes for workplaces. - Inviting testimonials of workplace harassment to build 'I Never Ask for It' at the workplace. THE NEXT TALK TO ME IS SCHEDULED FOR FEBRUARY 2ND, 2019. HOST A TALK TO ME WHERE YOU LIVE. TOOL KIT TO BE PUBLISHED MID NOVEMBER. SAVE THE DATE. REGISTRATION OPENING SHORTLY! Meet To Sleep invites all women, girls, persons to become Action Heroes by taking a nap in their very own public parks. Action Heroes assert the right to live free from fear and defenceless. Our bodies will, through new learnt experience, tell new stories ; located in belonging, connection, pride. Replacing fear, shame and violation. This is a call to global action. 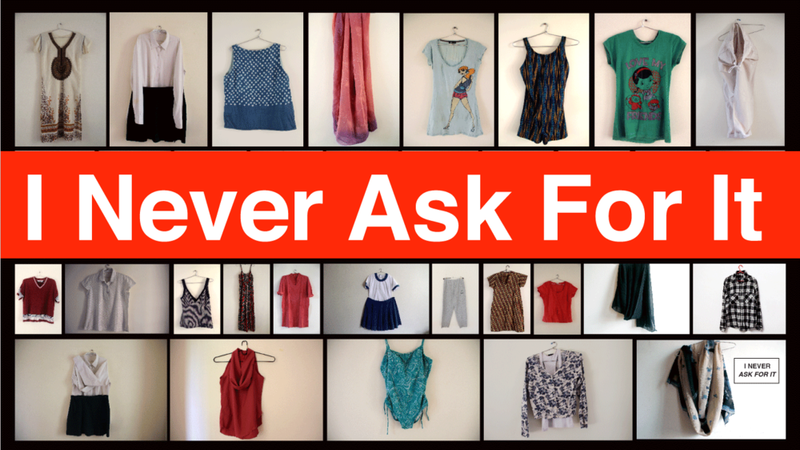 Bring the garment you wore when you experienced sexual assault, discrimination, harassment. The garment bears memory and witness to your experience. In 2023, ten thousand garments will assemble and stand in sites of public significance. Your voice and garment shape the collective mission leading survivors of sexual assault heal from blame. The Listener is Active/ Present/ Is Learning To Listen Better. The Opposite of Victim Blame is Being Believed. Create a #ListeningCircle in your City / Town this Oct 28. Step in to build #INeverAskForIt and unite to eradicate victim blame. Register by emailing in at actionhero@blanknoise.org, subject titled Listening Circle.